Dr. Monica L. Mercado served as Director of The Albert M. Greenfield Digital Center for the History of Women's Education from July 2014 to June 2016. 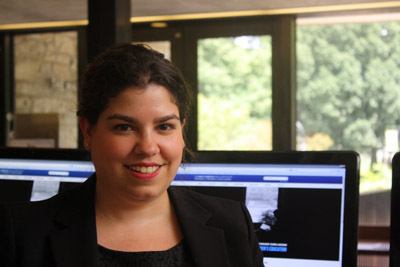 As Bryn Mawr's CLIR Postdoctoral Fellow in Academic Libraries (2014-2016), her work focused on the digital possibilities of women's history research and pedagogy and the development of college archives to better document contemporary and diverse histories. Monica holds a B.A. from Barnard College and an A.M. and Ph.D. in U.S. History from the University of Chicago, where she was a fellow at the Center for the Study of Gender and Sexuality and coordinated two campus history projects: "'On Equal Terms'--Educating Women at the University of Chicago" (2007-2009) and "Closeted/Out in the Quadrangles: A History of LGBTQ Life at the University of Chicago" (2011-2015). Over the past several years, she has taught courses in U.S. History and Gender and Sexuality Studies at Bryn Mawr College, the University of Chicago, the University of Illinois-Chicago, and the School of the Art Institute of Chicago. Monica also served as the adviser to "Black at Bryn Mawr," a research project initiated by Emma Kioko and Grace Pusey (Bryn Mawr College Class of 2015). For more on Monica's teaching, research, and publications visit monicalmercado.com. She can be contacted at mmercado@brynmawr.edu.